Today’s offering is another track recently brought to my attention by Bob at Dead Wax, and one which I simply had to own. Luckily there was an affordable copy for sale on eBay; I say ‘was’ because this little treasure is now mine! Issued around 1976, God is So Good and its flip Because He Lives (written by William J. Gaither) were recorded by nine year-old Joel Stafford, a severely disabled boy from Winston-Salem, North Carolina. Joel suffered from a rare and incurable bone disorder, osteogenesis imperfecta, a form of brittle bone disease. This congenital condition left his body unable to develop the collagen needed to build up his bones, and meant that he had to have steel rods implanted in his legs. Young Joel wanted to buy an electric wheelchair: he also loved to sing in church with his family. 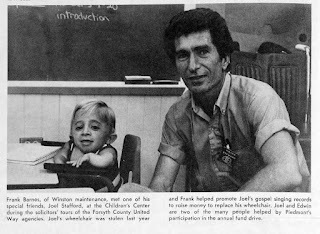 “I’m going to buy myself a wheelchair,” he told reporters from local newspaper the Statesville Record And Landmark in September 1976. “I’m going to take it to school so I can roll myself around.” To pay for the chair Joel persuaded his parent, Wayne and Linda, to take him to a local recording studio and cut his only 45. Instrumental support was provided by local band the Starlighters. Several bands have used the same name over the years, but these fellows appear to have been led by one Bert Starr and they released their own 45 on Unique records around the same time. 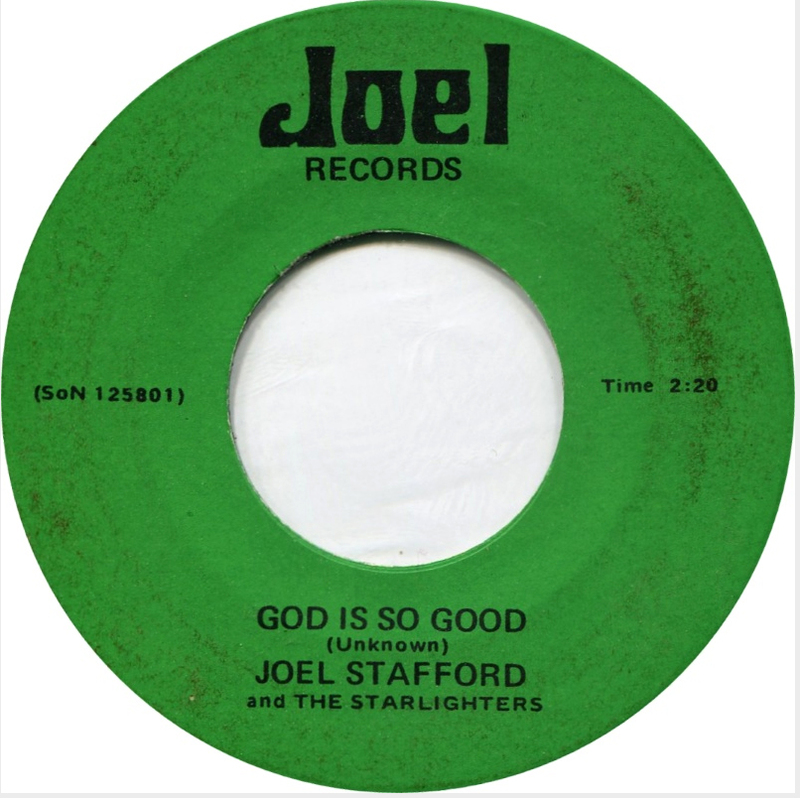 Issued on his own Joel Records label, he soon sold enough copies of his disc to pay the $1,500 or so for his chair. 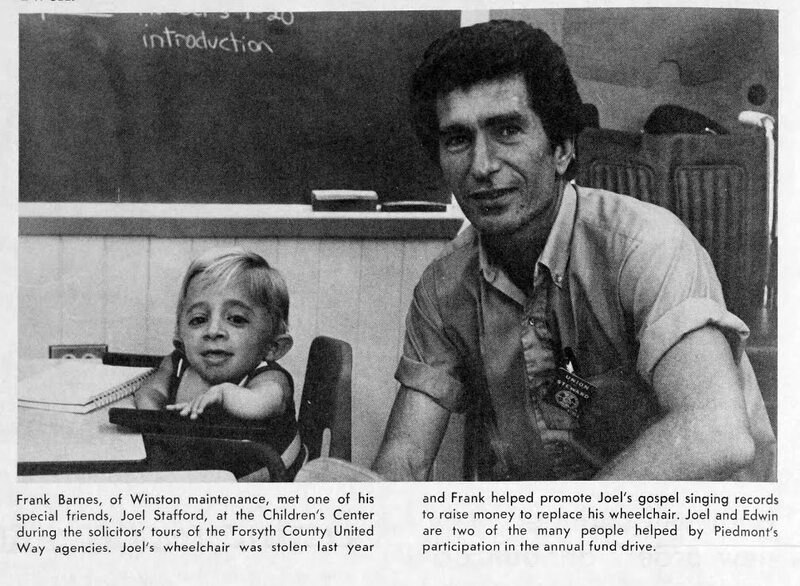 A strong-minded young man who enjoyed attending the Children’s Center In Winston-Salem, Joel was proud of his achievement and of his new chair, but unfortunately before long some low-down cur stole it, and he was forced to sell more copies of his 45 to pay for a second one. Luckily this time around he had support from the local community, as the press cutting here notes. Sadly Joel appears to have passed away; his father’s obituary (Joe Wayne Stafford died in 2003) mentions that his son predeceased him, but no other details. Luckily he left us his single, a lasting legacy to a brave little boy determined not to be beaten by the hand he was dealt. 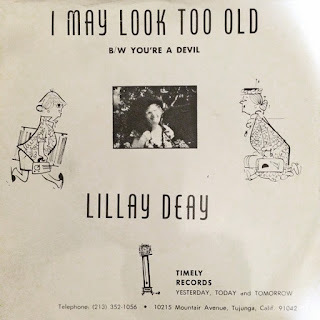 My latest obsession, thanks entirely to Bob at Dead Wax, is Mrs. Lila F. Daniels, also known as Lila Winton Daniels, but recognised professionally as Lillay Deay. I can tell you next to nothing about her, apart from that she seems to have been riding on the coattails of Elva Miller and, like her, only attempted to establish a career as a singer in her dotage. The big difference though is that Mrs. Daniels wrote her own songs. Born in 1896, she began her writing career in 1959 with The Christmas Star. In 1966 she penned the patriotic Lady of Liberty, and in 1967 she registered copyright in four songs, Appreciation, Our Beautiful Lady and Los Angeles, as well as Dancing Prancing Reindeer, the latter of which was recorded and released in 1969 (backed by Christmas Star) by the Daniel Singers or the Daniels Singers, depending on which pressing you ended up with. The ‘group’ was in no way related to the gospel vocal act of the same name. Christmas was a recurring theme for Lila. In 1969 she penned Is Santa the Man in the Moon, and 1973 brought Santa Clause Sweetheart. Other songs I’ve found credited to Lila/Lilay include the 1968 composition I’ve Hurt All I Can Hurt; in 1970 she wrote the songs He’s No Angel and Don’t Start What You Can’t Finish. I can’t help wondering if He’s No Angel is the same song (or at least is related to) the song that first introduced me to Lillay, He’s A Devil. In 1974, she composed the music for the songs Have a Happy Birthday and the Happy Birthday Clown; the words for both of these were written by Daisy Blackwood. Lila and her husband William hailed from Houston, Texas and had two sons, Robert and Dan. It appears that, in her 60s, she and her husband retired to California, as it was there that she set up her own record label: the few discs known to exist were issued by her own Timely Records, based in Tujunga, in the San Fernando Valley region of Los Angeles. Timely released at least three 45s, Our Beautiful Flag is Crying, Dancing Prancing Reindeer/Christmas Star and I May Look Too Old, backed with the amazing He’s A Devil (credited on the accompanying picture sleeve as You’re a Devil). And that’s all I’ve got. If you know anything more about her, or have any more music by her, please do let me know. Here are a couple of tracks to send you on your way: the amazing He’s A Devil (stolen, with heartfelt thanks, from Bob at Dead Wax), and Our Beautiful Flag is Crying, cribbed from YouTube and cleaned up a little by my own fair hands. A couple of tracks today from Bill Shepherd: songwriter, producer, arranger, orchestra leader and quite possibly Paul McCartney Mark II. Yes, even today there are still many ridiculous conspiracy theorists who claim that Paul is Dead, and that Faul (the fake Paul, geddit?) was replaced by one William Shepherd, a nascent singer and songwriter who previously led Billy Pepper and the Pepper Pots. It’s not a huge jump from Billy Shepherd to Billy Shears, and from Billy Pepper to Sgt. Pepper, after all. The clues are out there: Paul’s mysterious wonky eyebrows and his ‘are they/aren’t they’ attached earlobes; the photo of Faul from the back on the cover of Sgt Pepper, and the barefooted march across the cover of Abbey Road; cranberry sauce… Sadly, the Billy Pepper/Shears/Shepherd these idiots promote as Macca’s replacement died himself in 1988, which kind of blows their theory out of the water, ne-c’est pas? Never mind that Billy Pepper’s own singing voice and compositional skills leave rather a lot to be desired. There is no way that this man could have ever written anything as sublimely beautiful as For No One. No, it seems that our Billy Shepherd was the same composer and arranger who later went to work for the Bee Gees. Bill Shepherd was born in Surrey in 1927, and early in his career he worked with JoeMeek, when Joe was an in-house engineer at Pye. Shepherd first achieved notice in 1959 with his work as producer/composer on the Anthony Newley comedy Idle on Parade. He worked with Peter Sellers at Parlophone (with George Martin, Beatles obsessives!) and with the Shadows, penned the B-side to Jackie Lynton’s Over the Rainbow, and worked with Gene Vincent on his single The Beginning Of The End. 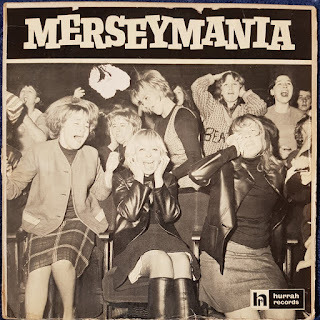 Shepherd had often been called on to produce quick knock off versions of TV themes and current instrumental hits, and in early 1964 he assembled a studio group, dubbed Billy Pepper and the Pepperpots, to record a clutch of tracks in the style of the Beatles for a couple of budget price cash in albums, Merseymania and Beat!!! 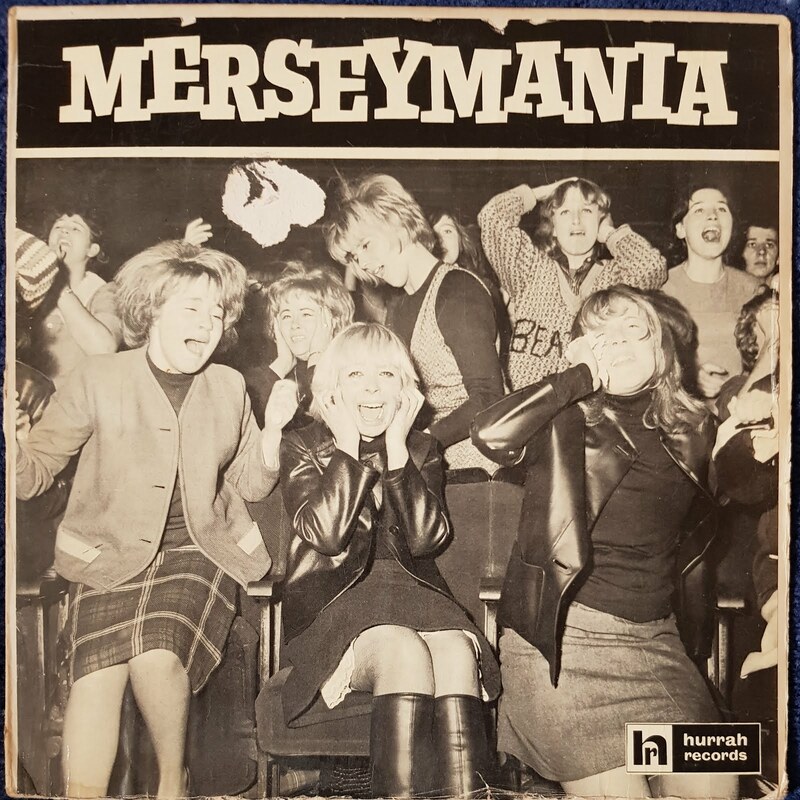 More Merseymania. With each album featuring nasty cover versions of a couple of Beatles tracks, plus up to eight originals written in a similar style, the cheap discs were often picked up by gullible parents wanting something Beatle-y for their kids. Both albums sold well, and have been endlessly repackaged over the years, with the band often being renamed. Billy Pepper recordings have been released under the names the Beats, the Mersey Beats of Liverpool (not The Merseybeats) and the Liverpool Beats. Shortly after the Merseymania recording sessions, Shepherd moved to Australia and joined Festival Records, where he began his relationship with the Gibb Brothers, a relationship they would renew after the group and the arranger both moved back to the UK – independently of each other - in 1966. He was responsible for many of their arrangements, and remained closely involved with all of the group’s work until 1973, when the Gibbs relocated to Los Angeles. During the same period he also worked with the Beatles protégés Grapefruit, Ritchie Havens, Gene Pitney, the New Seekers and Arthur Mullard. He died in L.A. in 1988. Just to add fuel to the fire, a Billy Shepherd was also wrote one of the very first books on the Fab Four, The True Story of the Beatles, published in 1964 by Beat Publications, publishers of the Beatles Book Magazine. It seems that most of the conspiracy theorists have either forgotten or conveniently ignored that. But then again it has been conclusively proven that that Billy was not our Bill, (or Paul, or Faul either for that matter); that particular Billy Shepherd was, in fact, one of the many pen names utilized by Peter Jones, a music journalist who wrote for the Record Mirror and, later, Billboard. Jones, under the pseudonym Pete Goodman, would also write the first book on the Rolling Stones. Anyway, enough of this nonsense; here is Billy, along with his Pepperpots, with their dreadful, atonal cover of I Want To Hold Your Hand and Bill Shepherd’s own composition, the frighteningly awful Seems to Me. Oo-wee-ee-oohh indeed! If you honestly think that a Beatle would have come up with a song as bad as this you need your bumps felt.